Leading American bellman cart manufacturer Glaro Inc.’s carts are being featured in Departures Magazine and fast becoming a symbol of quality in the hospitality industry. Glaro Inc. carts have even been used in theatrical dance productions because they are so easy to wheel on and off stage and can be used as highly maneuverable props. Glaro Inc. announces that its well known Glaro Glider Signature Series Bellman Cart model #8868 with ball crown top and six wheels is now being featured in an ad by Net-A-Porter.Com in Departures Magazine. The ad highlights the cart's sleek and classic design and its popular satin brass finish that has helped it gain popularity. Especially noteworthy is the decision to showcase Glaro’s six wheel design, known by industry experts for its “pinpoint maneuverability,” a term coined by Glaro Incorporated staff in the 1980’s. According to Bob Betensky, “pinpoint maneuverability is used on six wheel carts, allowing the user to easily swivel the cart in place, turn in tight areas, and even navigate uneven surfaces, all with a heavy, full capacity load. Customers tell us that our “push and pull” design makes Glaro Glider bellman and luggage carts among the most ergonomic, high performance carts in the market.” Glaro Inc. also has a full line of platform trucks and carts that have pinpoint maneuverability. While Glaro Inc. continues to expand and add new products to meet market demands, the American bellman cart manufacturer maintains its core mission: continue to build better bellman carts; maintain competitive pricing; manufacture on American soil; and, continue to “quick ship” products in a timely fashion of approximately three business days. 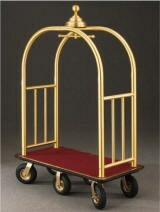 For more information on bellman carts, call (631) 234-1717 or visit glaro(dot)com. Glaro Inc. (glaro.com) is a leading USA manufacturer of commercial and consumer aluminum and steel products sold directly to distributors/dealers for almost 70 years. All products ship in 1 to 3 days. Glaro Inc. products are the result of a focus on thoughtful innovation and design. Product lines include bellman and luggage carts, platform trucks, waste receptacles, recycling receptacles, smokers’ posts and receptacles, crowd control posts and systems, safety barriers, signs, sign frames, directories, menu display stands, coat hanging equipment, coat trees, umbrella stands, wet umbrella bag holders, metal planters, and key drop boxes. A diverse selection of models in 31 finishes is produced in the Hauppauge, New York plant by skilled Glaro Inc. craftsmen. The company is known for its quality merchandise and its ability to consistently quick ship all products. The customer service department provides unusually prompt personal service and is sensitive to the needs of dealers and distributors.